Who Would Buy This: Those who would buy the Garmin nüvi 42LM 4.3-Inch Portable Vehicle GPS with Lifetime Maps (US) can make their driving experience more convenient. This portable vehicle GPS is particularly designed to be a dependable and easy-to-use guide for drivers who are travelling through difficult routes most of the time. 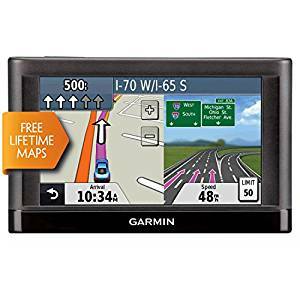 With its bright 4.3-inch display, spoken turn-by-turn directions and many innovative features, the sleek Garmin nüvi 42LM 4.3-Inch Portable Vehicle GPS with Lifetime Maps (US) offers dependable and easy-to-use driving guidance. With it, it is really quick to acquire a GPS satellite—mostly less than two seconds. In fact, this has been proven by users who took this device and said it has always been fast in acquiring satellites. The nüvi 42LM also offers detailed maps with free lifetime updates. With maps of the lower 49 states, you can easily find millions of addresses and points of interest. The map updates are pretty good, where updating it once can make the process very smooth. This GPS has 4GB of space and the maps would take about 2GB, so there will be a lot of free space for future updates. This GPS from Garmin sports innovative features, such as the “lane assist with junction view” that indicates the right lane for a turn or exit with detailed images and brightly colored arrows. Also, the nüvi 42LM displays the current speed, speed limit and accurate arrival time. Moreover, this GPS features great one-stop device management, like using the Garmin Express to keep your nüvi up-to-date and to make it easy to update software and maps, transfer favorites to and from devices, and install free custom vehicles and voices. It is also compatible with many Garmin mounts and works perfectly with them. You might find it frustrating to find no manual with the device out of the box. Also, when you plug the device in and register it, there would not also be a link for the device, which would make sense otherwise. However, by trial and error to find its correct manual on the Garmin web site, you can figure out how to download and open up the Garmin Express program on your computer, which provides a way for you to download it. So, this should be no problem if you have the know-how’s of researching on the net and the official website. In purchasing this Garmin GPS device, you will be provided with 1 year limited warranty. Considering the perks you get from the Garmin nüvi 42LM 4.3-Inch Portable Vehicle GPS with Lifetime Maps (US), they (undoubtedly) cannot be outweighed by its drawback. This is a product that is worth investing in for your driving comfort.